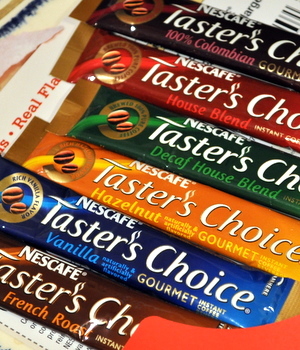 From the look of Nescafe Taster’s Choice Sticks, you might assume that they want to compete with Starbucks Via by offering sleek single-serve packets of various different flavors of coffee. And they probably do, so I picked up a sample pack to try and compare it to Via, which is now my go-to instant coffee. The problem with Nescafe Taster’s Choice Sticks is immediately obvious: the packets are filled with instant coffee. Like most freeze dried coffee, the overall flavor is very weak and far too easy to water down with too much liquid in your cup. Unlike instant coffee from a jar, there is no real way to adjust the strength of your coffee by simply adding more; the amount you can use is limited by the amount in the packet. The coffees are, across the board, weak and not very satisfying even for a quick fix. Doubling them up helps some, but they don’t have the robust flavor of something like Starbucks Via no matter what you do. If you do like your coffee on the (very) mild side, there is one thing to look forward to here. The flavored coffee sticks, like the vanilla and hazelnut, have a very nice (mild) flavor and aroma to them. I will keep some on hand for emergencies – not a bad idea for an actual emergency kit, actually, because they last almost forever! – but I doubt that I’ll be buying these to use on a regular basis.